African Jamaican history is marked by disruptions. Kidnapping during the period of slavery, the challenges of settling in Jamaica in light of the geographical and social landscape, Black Jamaicans making a living after emancipation as well as contending with British culture. The challenges of making a living also resulted in rural and urban disruptions. How has the small village of Woodside, in the hills of rural Jamaica responded to all of these disruptions? 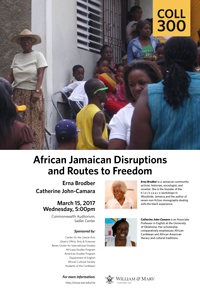 Jamaican scholar and Woodside resident Erna Brodber and Black Atlantic scholar Catherine John-Camara will tell that story addressing this village’s particular past, the challenges faced over the years and various efforts on the part of community members to respond to these disruptions, disturbances and unrest. This story will also include other stories about how visitors to the community have responded to simply being there and experiencing Woodside as a geological and social space. Erna Brodber is a Jamaican community activist, historian, sociologist, and novelist. She was born in the rural village of Woodside in Jamaica and continues to reside there. She has worked as a children’s officer in the civil service, as well as a teacher, and between 1968 and 1985, as a research assistant and lecturer in the Department of Sociology and as a research fellow in the Institute of Social and Economic research at the University of the West Indies, Mona. She is the founder of the b l a c k s p a c e workshops in Woodside, Jamaica. She is the author of seven non-fiction monographs dealing with the black experience, including The Second Generation of Freemen in Jamaica 1907-1944 (University of Florida, 2004), The Continent of Black Consciousness (New Beacon, 2003), Woodside, Pear Tree Grove P.O. (University of West Indies, 2004); as well as six novels including, Jane and Louisa will soon come home (New Beacon, 1980), Myal (New Beacon, 1988), and Louisiana (New Beacon, 1994). Myal won the 1989 Commonwealth Best Book Prize for the Caribbean and Canada. Her current book project deals with the interaction between African Americans and African Jamaicans between 1782 and 1996. In 2017, she received the prestigious Windham Campbell Prize at Yale University in the fiction category. Catherine John-Camara is an Associate Professor in English at the University of Oklahoma. Her scholarship comparatively emphasizes African Caribbean and African American literary and cultural traditions. Her book Clear Word and Third Sight: Folk Groundings and Diasporic Consciousness in African Caribbean Writing was jointly published by Duke University Press and The University Press of the West Indies. Her current manuscript is titled Afro-Indigenization: Internal Power as Cultural Practice. This new project addresses Hip Hop Studies, which has been part of her teaching expertise for ten years. Her other research interests include grassroots social and political culture as well as Black independent cinema. She is the co-creator of the “Unlearning Racism” faculty workshop, which, together with three other workshops, is being launched at OU in the Fall of 2016. She has worked with Erna Brodber for sixteen years, helping to organize and bring participants to the b l a c k s p a c e workshops in Woodside, Jamaica.